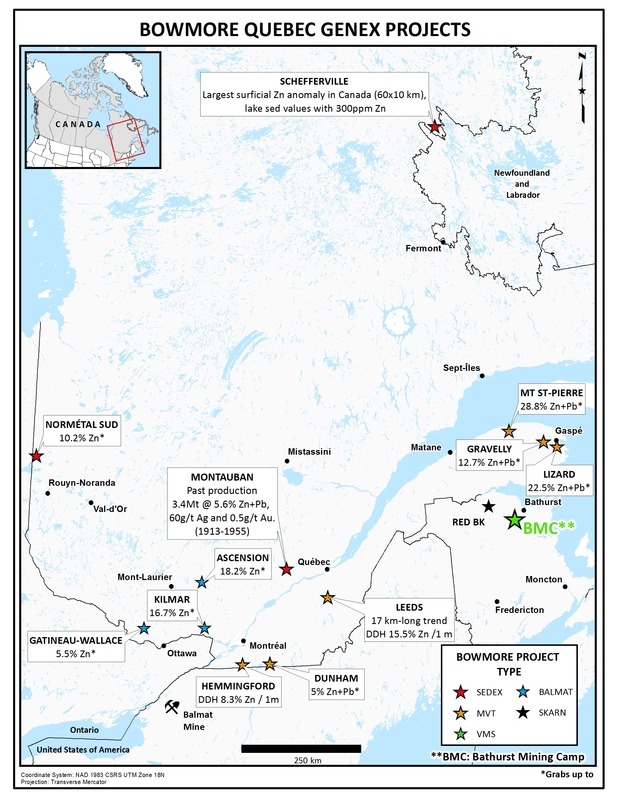 Bowmore Exploration Ltd. is very pleased to announce that it has staked 12 grass-roots zinc properties covering a total of 42,000 hectares of mineral claims throughout the province of Quebec. Regional geological research and expert analysis and compilation of surface sediment geochemistry and mineral occurrence in governmental databases identified 12 under-explored zinc targets that were available for map staking. These are referred to as the Quebec Genex projects, the map staking was completed during the last four months. The properties are all hosted in classic geological environments for zinc including stratiform sediment-hosted and its metamorphic equivalents ("SEDEX" and "BALMAT"), volcanogenic massive sulphides ("VMS"), and the Mississippi Valley Type ("MVT"). Mr. Paul Dumas, President of Bowmore, stated "These Quebec Genex projects offer an excellent growth opportunity in base metals and, more specifically, in the zinc space in Eastern Canada. Fieldwork in 2017 will prioritize the projects based on exploration success." The Schefferville property is located in the Labrador Trough and hosts highly anomalous zinc in lake sediments throughout the Menihek Formation sedimentary basin. It is the largest continuous zinc lake sediment anomaly in Eastern Canada (at greater than 500 ppm Zn), being 60 kilometers long and up to 10 kilometers wide. The source of the zinc anomalies has never been discovered but is believed to be one or more blind SEDEX deposits. The Montauban property is located 70 kilometers west of Quebec City, next to the former Montauban mine that produced zinc-copper-lead-silver-gold from a metamorphosed SEDEX or VMS deposit. The deposit is hosted in quartz-biotite gneiss of the Grenville Supergroup. The Montauban property covers nine surface showings with historical grab samples assaying up 17% Zn. The showings occur over a distance of 7 kilometers and this trend has only been sporadically drilled. The Normetal Sud property is located in the Abitibi belt, south of the former Normetal mine where more than 10 million tonnes of ore were produced between 1937 to 1975 grading 5.3% Zn, 2.2% Cu, 65.5 g/t Ag and 0.86 g/t Au. Six showings hosted by black shales have reported grab samples that have assayed up to 10% Zn. This area has never been previously drilled. Other properties in Quebec include six properties in the Appalachian fold belt that host showings of MVT-type mineralization (reported grabs up to 29% Zn+Pb) that have seen little or no previous drilling, and three properties that host metamorphosed SEDEX (BALMAT-type) surface showings (grabs up to 18% Zn) that have never been previously drilled. These properties were staked in addition to the Company's projects in the Bathurst Mining Camp that hosts the prolific Brunswick No. 6 and No. 12 mines that together produced close to 150 million tonnes at 12% combined Zn + Pb prior to the mine closure in 2013. Additional compilation in 2017 will lead to other acquisitions that will add to Bowmore's new zinc portfolio in Eastern Canada. Jeff Hussey P. Geo., is the Qualified Person who has reviewed this news release and is responsible for the technical information reported herein.